Two women were killed and several others were injured, on seriously, when a tornado ripped through the town of Fairdale, Ill.
FAIRDALE, Ill. -- Two women were killed, 11 people were injured and dozens of homes were destroyed when an EF-4 tornado touched down in the small town of Fairdale, Ill. One of the injured remains hospitalized in critical condition Friday, officials said. Jacqueline Klosa, 69, was killed when a tornado struck her home in Fairdale, Ill.
"Those victims that were in the areas were the most devastating spots in this town. There were 17 homes that were leveled and the debris piles that are just unbelievable," Kirkland Community Fire District Chief Chad Connell said. Schultz' body was found Thursday night by family members. Klosa's body was found in her bathroom by recovery workers on Friday morning. 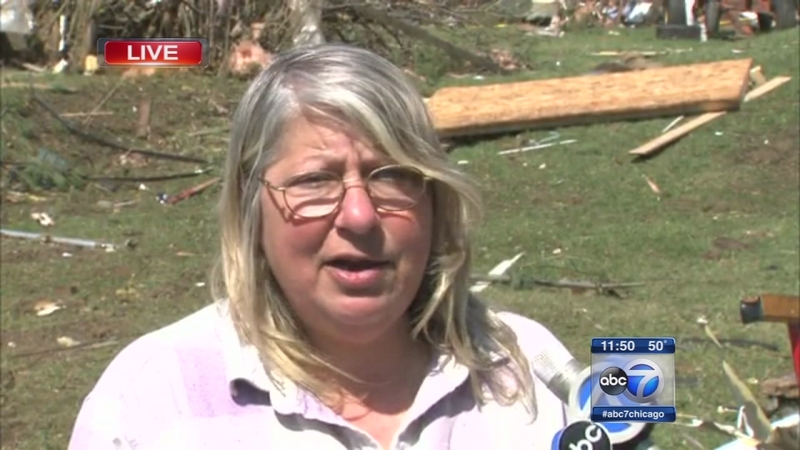 She had sought shelter there and had spoken with her sister just minutes before the tornado hit. Overnight, crews from 15 agencies double-searched 71 buildings, most of which were homes. A third sweep took place Friday morning. After heavy equipment was brought in to move large debris, dogs were called in for a final search. "We think we have everyone accounted for. However, we need a little leeway for any last-minute information we get. Right now, we have no specific person that's unaccounted for," DeKalb County Sheriff Roger Scott said. "We're hoping our search will be fruitless, and we won't find anybody," Sycamore Fire Chief Peter Polarek said. The search and recovery ended Friday afternoon. The National Weather Service says preliminary findings indicate the tornado that hit Rochelle and Fairdale was an EF-4, with wind speeds up to 200 miles per hour. About 150 people live in Fairdale, which is 80 miles northwest of Chicago. Every home was damaged, officials said. Seventeen buildings were destroyed, including Susan Meyer's home. "The roof blew off. The walls came down and the second floor fell on the first floor," Meyer said. "I need a new house." Meyer said she had just spoken with a neighbor when the storm struck. "I started to go downstairs and the windows blew out behind me and the dust and debris started coming from behind me. A couple boards fell, but they hit the wall and hit me, but they didn't hurt me," she said. "I just kind of hunkered down in the stairwell and that was probably the best place to be in the house because all of the windows blew out. And the debris. There's no rhyme or reason to where the debris landed." Meyer said eight of her pet birds are missing. "I'm hoping that they're in some sort of little pockets under the debris that I'll be able to rescue them," she said. Bernice Jacobs is a very lucky woman. Although her Fairdale home sustained damage, it is still standing - and she is ready to pick up the pieces. Residents, escorted by law enforcement officials, will be allowed to return to their homes to see if any belongings can be salvaged at 7 a.m. Saturday. All utilities to the town are off and will remain that way until further notice. "The hardest part: things don't get done quick enough. It's painstaking time to do what we're doing," Chief Connell said. The American Red Cross has arrived in Fairdale, but officials are asking all other volunteers to stay out of the area until asked. To help the Red Cross with relief efforts, visit www.redcross.org . Meyer, who spent the night at a shelter, said the Red Cross gave them food, a roof over their heads, and help with confusing forms during a difficult time. "I spent the night thinking pretty much how lucky I was and all the things I had been worried about that I don't have to worry about anymore," she said. "It seems like there's an opportunity to rebuild things in a good way." 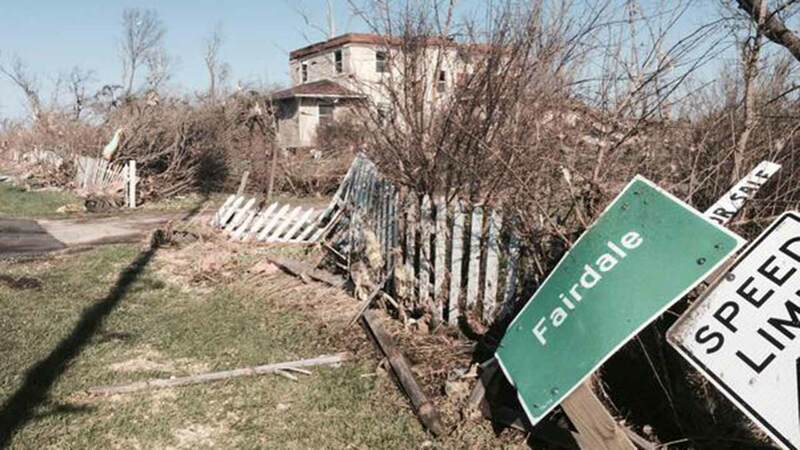 Fairdale does not have tornado sirens, but Kirkland Fire Department officials said emergency responders had "ample warnings" through media and the National Weather Service. Bernice Jacobs saw the tornado alerts on TV. "All of the sudden, it got real quiet. And then we heard a woosh and went running," Jacobs said. Jacobs was with her son-in-law and 3-year-old granddaughter. "Her father grabbed her on the stairway and got her to the basement." Jacobs lost a garage and had some other damage, but she and her family are OK. Several homes in nearby Rochelle was also damaged, but no one was seriously hurt. Ill. Gov. 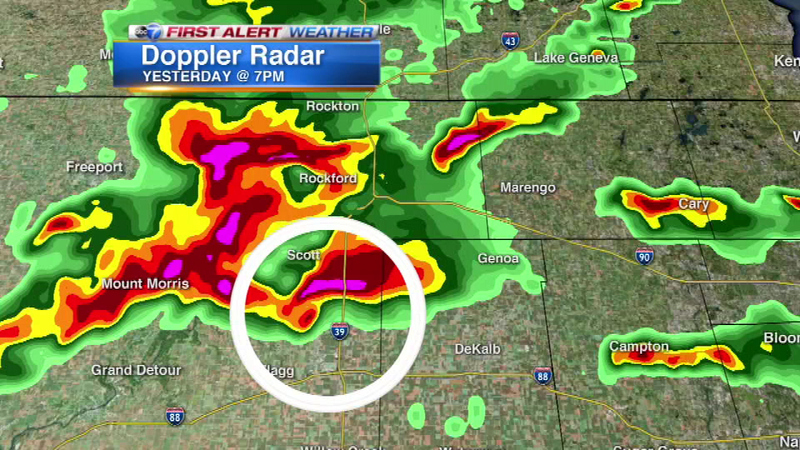 Bruce Rauner toured the tornado-ravaged area and issued a disaster declaration. "We are very blessed that more people were not hurt. This was a devastating storm," Rauner said.